Held on the fourth Thursday of September every year, the Judge Clifton M. Kelly Champion for Children Awards Gala elevates our community's outstanding child advocates to celebrity status. You can help us to select this year’s Champion for Children award by nominating a qualified child advocate. Finalists Nicholas Brooks, Patricia Carter, Eddie Cuencas, Andrea Fennell, and Camille Shaffer were honored from stage. Each finalist received a small gift of appreciation and was presented with a crystal award for their ongoing commitment to bettering Highlands County through their positive impact on the lives of our children and youth. Additional awards were also presented throughout the evening's program. 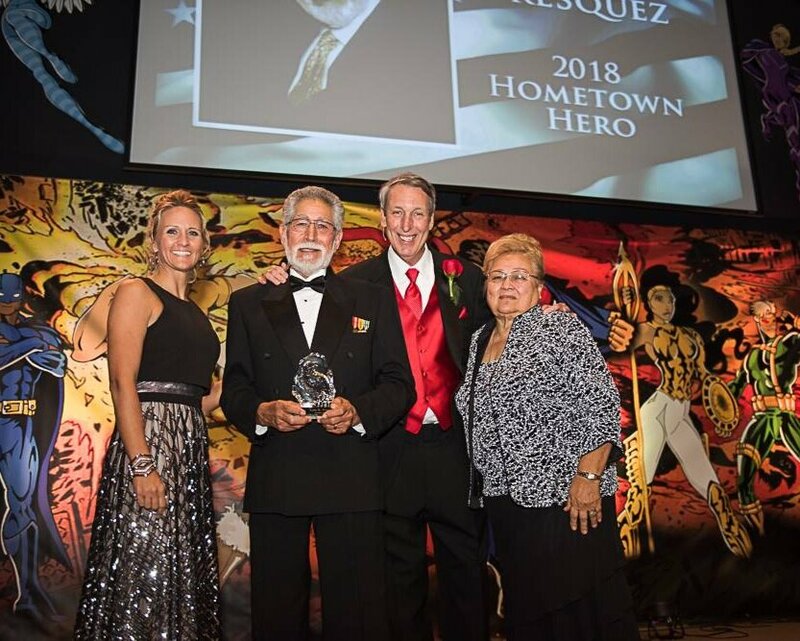 Leesa Skipper accepted the Distinguished Lifetime Achievement Award in honor of her husband, John R. Skipper Jr.; and LtCol Luis R. Fresquez, USMC (ret) received the Hometown Hero Award. Special musical performances by Jill Jernigan, Abi Smith, Eva Bates, Tristen Cathey, Ashdon Dennison, and Leona Fountain enhanced the program throughout the evening. Then Macie and Brooke Fann graced the stage to present the envelope containing the name of the 19th Annual Champion for Children Award recipient. Dance instructor Camille Shaffer, who has been positively impacting children for 26 years, was announced as this year's "Champion for Children". Shaffer shared, her "greatest accomplishment on behalf of children is my ability to empower them to trust their own voice. To be strong, even if it means being alone." Thank you to all sponsors, child advocates, and community leaders for your positive support and active involvement in this community celebration of local heroism. Congratulations and thank you to all five finalists, and this year's Champion for Children, Camille Shaffer. 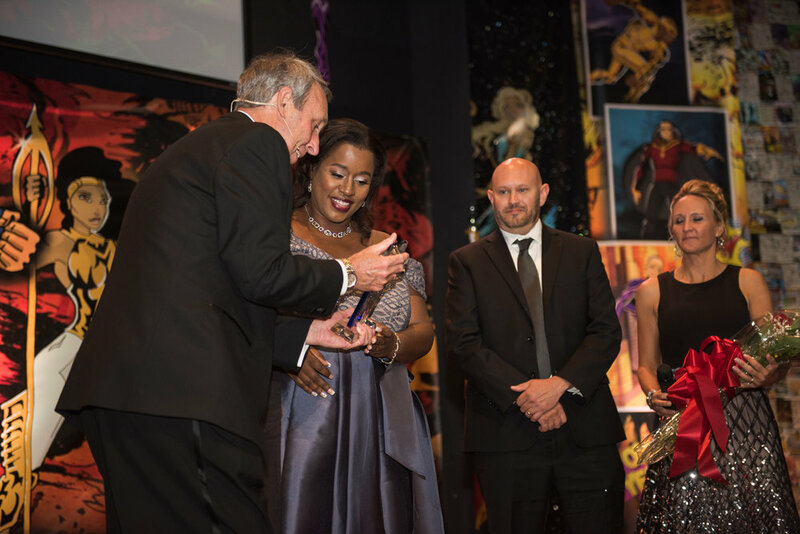 *Champion for Children Foundation Executive Assistant and Graphic Designer, Kati Pippin, created all the original artwork and superhero characters for this year's Awards Gala. In addition to serving 25 years as head of the Tenth District Circuit Court, Judge Kelly designed a crime prevention curriculum and textbooks still being used to teach children that crime produces consequences and that bad decisions…at any age…may prevent an offender from ever achieving his or her dreams. But the Judge’s work was not limited to legal matters. He saw the need to create a caring community environment in which the well-being of children and families is fostered through strong human services agencies. He served on several boards, including a college, a public hospital, and a charitable trust. Whether in a meeting of a PTA, a Children’s Services Task Force, a truancy study group, a presidential search committee or serving as a mediator in a school expulsion hearing, Judge Kelly was consistent in expressing his core values: integrity, obedience, respect and personal responsibility. Through many avenues he paved the way for countless other citizens to follow his lead. Although he passed away in 2005, his influence remains clearly evident in the work of the Champion for Children Foundation, and the Children’s Services Council. The annual Champion for Children Awards program identifies outstanding persons who agree with the Judge that investing in children and in youth is well worth the effort involved. Selection of the Highlands County “Champion for Children” begins with nominations submitted by the general public. Every year since 2000, the Champion for Children Foundation has issued a call seeking nominees. All nominees are reviewed carefully by a Screening Committee. This Committee identifies Finalists who are asked to prepare more detailed summaries of their advocacy for children and youth. The Nomination deadline for the 19th Annual Judge Clifton M. Kelly Champion for Children Awards Gala has passed. promotes continuation of his/her advocacy or service by enlisting others to join in solving the problem, thus producing ‘a ripple effect’ that enhances the well being of children and the community.